I have a friend who loves Star Wars. (I might be a bit fond of it, too, but that’s another story.) 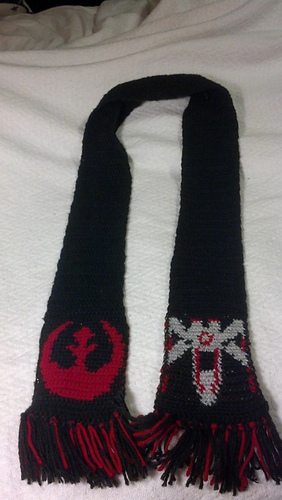 She was complaining about boring winter gear, so I decided she needed a Star Wars scarf--and an X-wing would be a perfect thing to put on one end of it to balance out the symbol of the Rebel Alliance on the other! 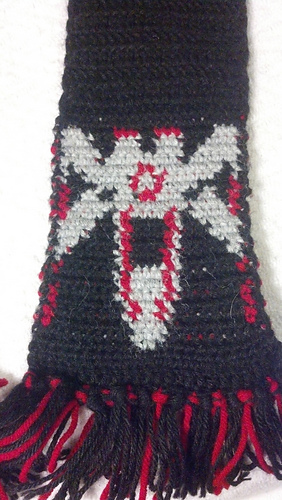 The problem was that I couldn’t find a pattern/chart for an X-wing. (There’s at least one free one for the Rebel Alliance.) So I made my own. I don’t remember what size hook I used, except that it was pretty small so I could get enough stitches onto a reasonable width for a scarf. The yarn was all stash yarn that lost its labels long ago. I numbered the chart from right to left, left to right, right to left, etc., to help me keep track of where I was as I went. No idea if that’s standard or not; sorry if it’s confusing.